H and I traveled to the North Georgia Mountains, also known as apple country, this past weekend. Orchards in the area offer over twenty varieties of the fruit (who knew?). This time of year, apple festivals delight visitors and the eatin’ is mighty tasty! 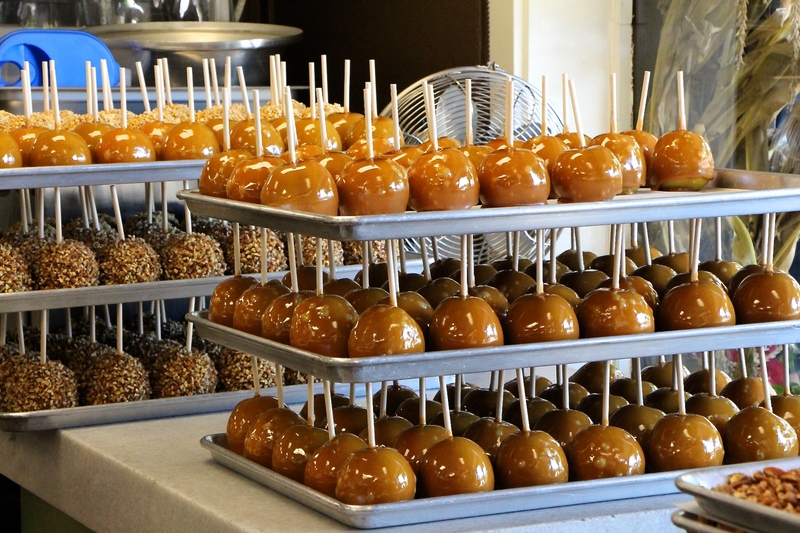 It’s a sure sign of fall when even the local fudge shop offers seasonal caramel apple treats. That picture makes my mouth water. I love apples and everything associated with them, which is one of the reasons (one of the many) that I love this time of year. Here, we are soon to harvest the Arkansas Black Apple (it’s the name, not the color), and I can make applesauce without added sugar, they are so sweet on their own. Oh, how I love apples! I LOVE apples too, but I like the ones that are a bit more tart. These apples in the photo were huge!